Children are helpless sufferers from adverse thoughts, for a child's mind is a clear sensitive palate that receives impressions without protection. Until children are fourteen years of age their physical condition is largely the result of suggestion and impressions gathered from the adult minds about them, while the predominant caring adult determines to a very great extent the mental and physical conditions of their child. For most people, the problem with being compassionate is that we fear if we offer it, we'll somehow be condoning and encouraging hurtful behavior. Yet, as we connect with compassion, life can be changed for the better, with changes lasting the span of a lifetime. The real power of compassion is choosing it in the midst of difficult situations involving behaviors that we find upsetting and entirely off-putting. How can one be expected to be compassionate in the midst of unacceptable behavior? How indeed? When we see children or adults around us behaving unskillfully or unproductively, with actions that are intended to affront or cause harm, they need our understanding and compassion. This is the fork in the road, where we find we have a choice of either compassion...or judgment. It's important to understand that compassion does not mean that you condone hurtful or unskilled behavior. Instead, it's reaching into yourself to relate to people with a heartfelt energy of compassion that they can hear and assimilate. Every time I've chosen compassion, I find I am deeply astounded, not only at the power of this force, but that it really works to shift and change a situation. We often miss an essential point. When you go to that compassionate place that's deep within yourself, to look at the person who is doing something upsetting, you are not only giving compassion, but you are also receiving what you've just given. You simply cannot launch a negative attitude or a judgment at someone and still feel peaceful and good about yourself. During those moments, it's impossible to feel lovable or safe. There has been a significant amount of research about compassion, in the areas of human development and behavior. In the most current research-based assessments, psychologists have observed that a compassionate response to challenging individuals and situations yields a positive reaction 70% of the time. Whereas, responding with resentment or anger produces a negative reaction 100% of the time! So which odds would you choose? As I've illustrated in my book, Attitude Alignment: The Art of Getting What You Want, if you want the problematic situations in your life to dissipate and improve, start "throwing compassion" at the person or at the problem behavior. I know it sounds too simple, but try it. The next time you are upset, throw compassion at the problem and see how the situation changes before your very eyes. 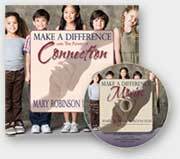 The stories in the following pages of Make A Difference with the Power of Connection are small but powerful reminders of what the highest and best part of you already knows: that compassion makes us protective rather than controlling. The difference is crucial in creating long-term, life-enhancing results. To get what you want, you must give away what you want.